Real-time, point-of-care detection of critical bacterial colonization relies primarily on subjective visual inspection and clinical signs and symptoms. When wounds are illuminated by violet light, most pathogenic bacterial species emit a unique red fluorescence signal due to the production of endogenous porphyrins, while Pseudomonas aeruginosa uniquely emits a cyan (bluish-green) fluorescence signal due to the production of endogenous pyoverdine. Fluorescence imaging has recently been used to detect red fluorescence from porphyrin producing bacteria (e.g. S. aureus, E. coli, S. marscecens, A. baumannii, etc.) in wounds at the bedside with a positive predictive value (PPV) of 100%.1 A prospective single-centre clinical study was performed to evaluate the PPV of cyan fluorescence observed on fluorescence images in predicting the presence of Pseudomonas aeruginosa in chronic wounds. 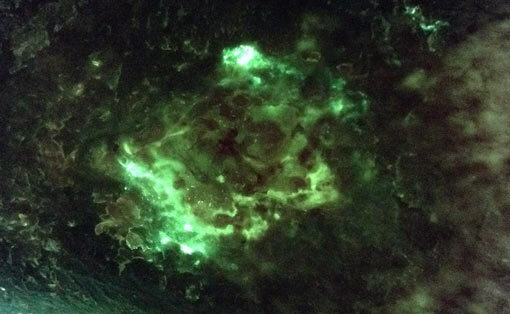 5 patients with chronic wounds exhibiting bacterial (cyan) fluorescence were enrolled. Cyan fluorescing regions were sampled using curettage method to correlate cyan fluorescence signals to presence of P. aeruginosa. 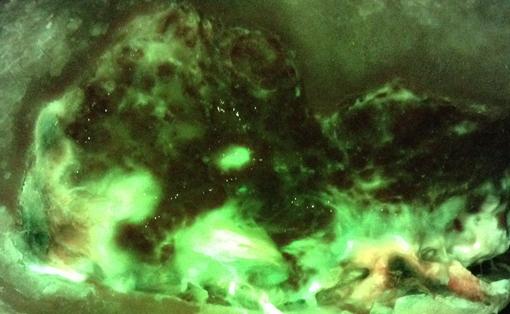 Cyan fluorescence from a discretely sampled area of the wound resulting in a microbiologically-confirmed presence of P. aeruginosa was defined as a true positive result. Semi-quantitative culture analysis of curettage tissue samples yielded a PPV of 100%. Total bacterial load ranged from moderate or heavy growth of P. aeruginosa. 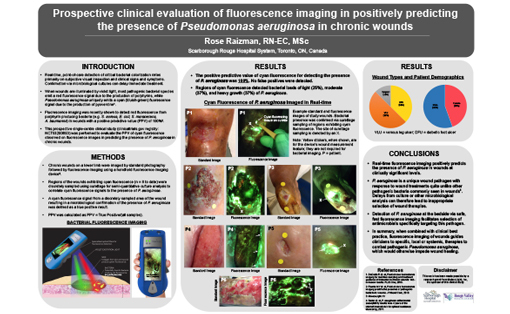 Real-time fluorescence imaging positively predicts the presence of Pseudomonas aeruginosa in wounds at clinically significant levels. 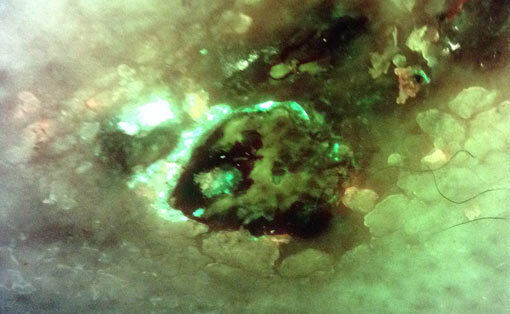 When combined with clinical best practice, fluorescence imaging guides clinicians to specific, local or systemic, therapies to combat pathogenic Pseudomonas aeruginosa, which would otherwise impede wound healing.